The students of CET and HEQ were given a tour to start of the year of Sargent Corporation showing the students what local companies have to offer the students upon graduation. 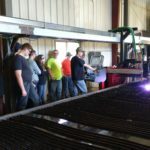 They toured the maintenance facility, paint bay, fabrication department, small tools, and welding shop where they make excavator buckets that are shipped all over the country. The tour ended with a presentation about the Summer Sargent Academy that is available for high school graduates.